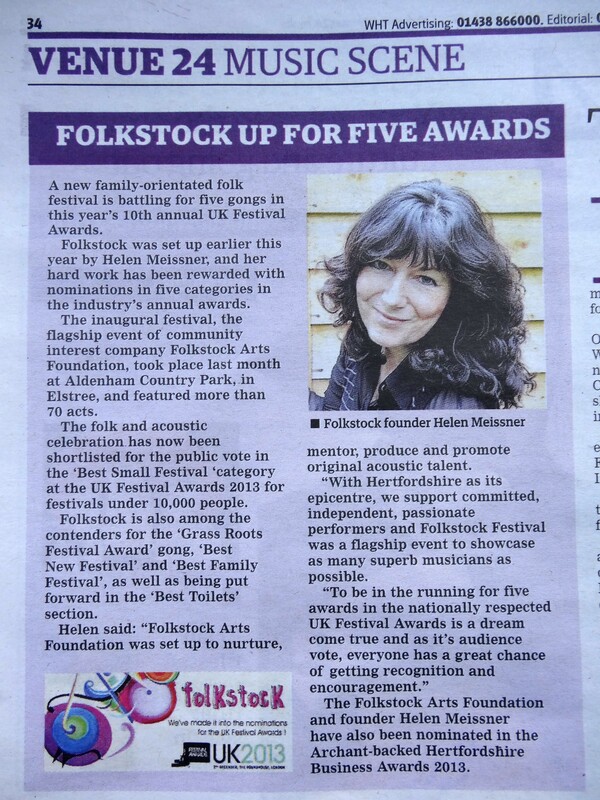 It’s awards season and Folkstock has joined the party! 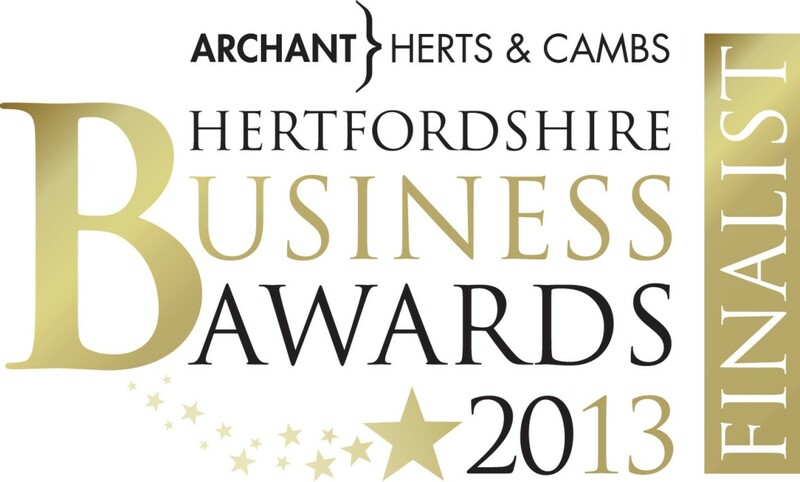 As you probably know, the Folkstock Arts Foundation community interest company was set up in February of this year, and we are delighted to have won a place in the finals for two Hertfordshire Business Awards: for Hertfordshire Business in Community Award and Business Person of the Year (for our Festival Director Helen Meissner). The next stage for the 5 finalists in each category, is to be visited by the judges and the announcements are made at the Knebworth Barns ceremony on 28th November. Other Herts based finalists include Harriet Kelsall Jewellery from Weston, who is a highly feted entrepreneur who co incidentally has been a great supporter and sponsor of Folkstock Arts Foundation musicians! A week later, on December 2nd, the UK festival awards announce their winners in London’s prestigious Round House, which until the end of October also incorporates a public vote. We are thrilled to be included in the nominations for 5 awards, including Best New, Best Small, Best Grassroots, Best Toilets and Best Family festival! Other Herts based festivals are also nominated for various awards, or can be voted for by the public if you go to the Festival Awards website and all of these listed had Folkstock artists performing or indeed whole stages managed and curated by the foundation for acoustic musicians – they are Standon Calling, Wilkestock, Balstock and Folk by the Oak. You can vote until the 1st November if you feel so inclined, for any festival you have enjoyed. If they are not nominated, you can suggest them for ‘Best of the Rest’. To vote click here. “We are thrilled that the awards nominations have given us another chance to promote the foundation which will increase the profile of the musicians who are associated us. Many Herts based musicians were included in the 16 who have been on our mentoring, marketing and masterclass programme this year and they have performed at a number of events put on by the foundation this year. However, we are not sitting on our laurels, in fact, regardless of the outcome that getting this far in these lovely awards has afforded us, we are in a very exciting developmental time. them to make a living from music. 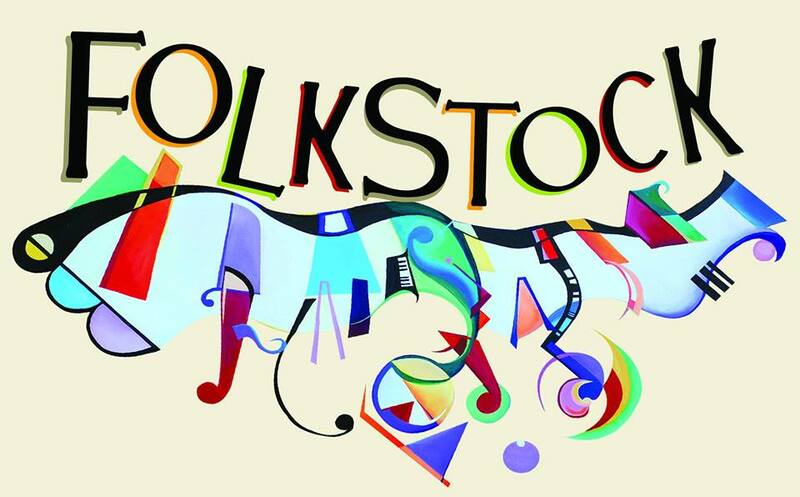 Introducing Folkstock Represents and Folkstock Records”. 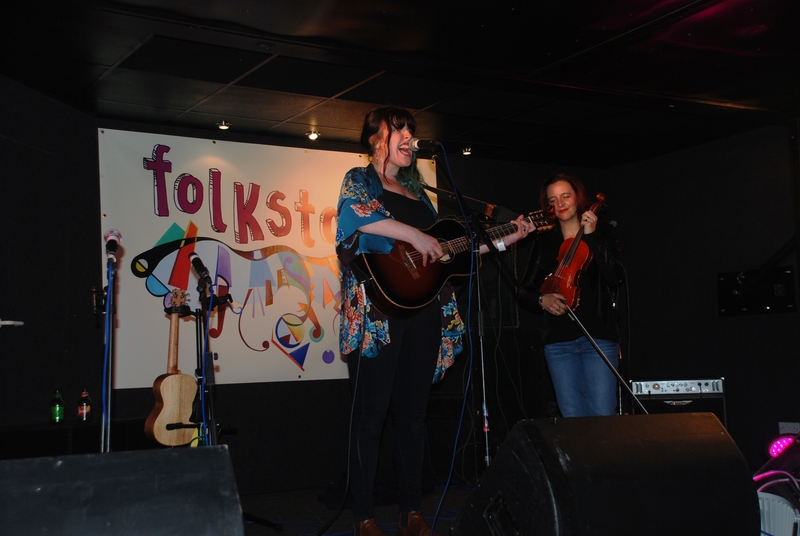 This time last week Folkstock Festival had drawn to a close. This week, I think my blog is drawing to a close too. Aside from our wonderful videos, which will be posted up shortly (I’ll notify all my readers via my Folkstock twitter feed when they are completed and uploaded), I’d like to sign off with my 10 favourite things about Folkstock Festival. Hopefully you’ve enjoyed my ramblings and perhaps there’ll be a Folkstock Festival next year, that I’ll see you all at?! 1. The “game for a laugh” mentality. This blog, although often carrying a serious message, is meant to be a bit of fun. I was invited along to blog from a young person’s perspective – and that’s the tone and style I’ve tried to keep. My blogging team were set the same task. Sound editor and interviewer Mikey D interviewed many of the artists, and came up with some unusual lines of questioning. I love that everyone was game for a laugh! (That bizzare conversation at the Morris dancing performance… that was us. sorry). 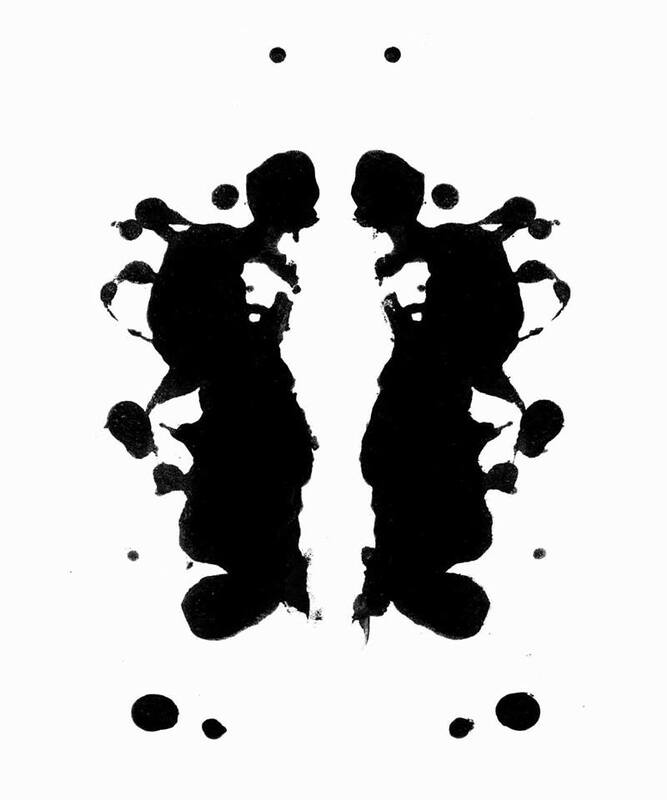 NOTE: You’ll also find the full results of Mikey’s ink blot tests on this sound bite too! I loved that Folkstock Festival didn’t take itself too seriously. I was a little worried that it could become commercial – but it stayed true to its independent festival ethos the whole way through. I love it when artists are able to connect with their audience. And better still, when they are down to earth enough to be able to laugh at themselves, and invite us (as an audience) to laugh along with them. Lucy Ward got this spot on! She laughed at herself, we laughed at her, she poked fun at us (mostly for not singing along loud enough), we played along (mostly by shouting her songs back at her). It worked. Thanks to Espiritu, there was colourful hair galore at Folkstock Festival! And in fact, some people had got the memo and arrived with their own various funky hair colours ;). I loved that people just felt relaxed and comfortable all day! Most of all Nick (the Nick and The Sun Machine variety) who kitted himself out at The Grand Vintage Fair stall before going on stage! There was plenty of this going on last Saturday (21st September). I must admit, one of my favourite sing-alongs was at the Turn Up The Sun stage – an enclosed space (like a circus tent) perfect for this kind of activity – and was with the band Ryewolf: they were just fun, and played the kind of traditional folk music that has you tapping your feet and clapping along. Some festivals give away wristbands and glow sticks. 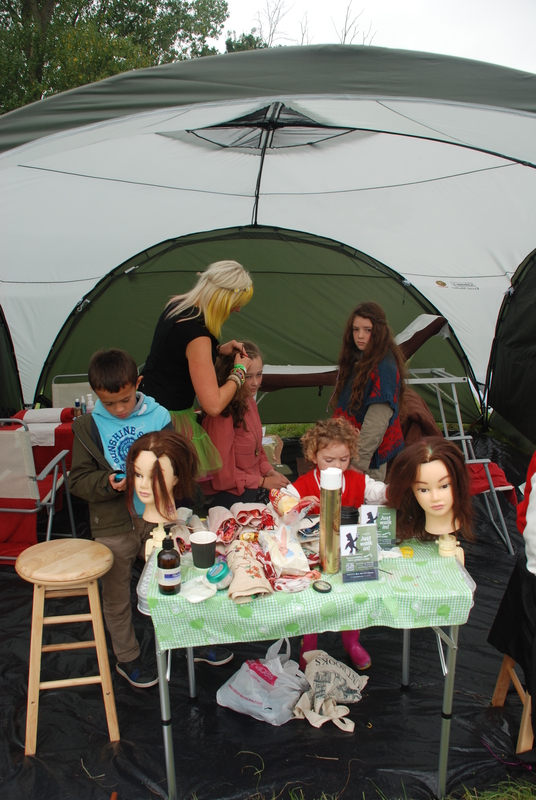 Folkstock gave away hair styles, updos, hair chalks, braids, head messages, foot massages, etc. Thanks to Espiritu Spa and Salon! There were so many good stalls at Folkstock Festival. 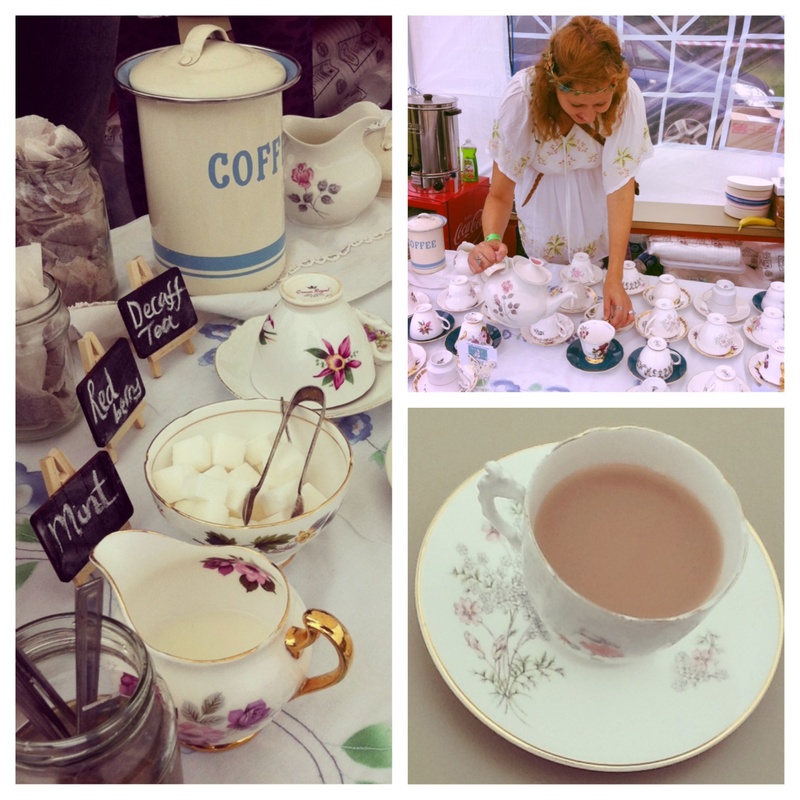 I loved the CD stall (Talking Elephant), but my favourite quirk of the day was being able to enjoy a cuppa from a china tea cup and not a styrofoam cup! Thank you Time 4 Tea! Pizza stand with a stone-fire oven. Crepe stall. I don’t think I need to even say anymore. 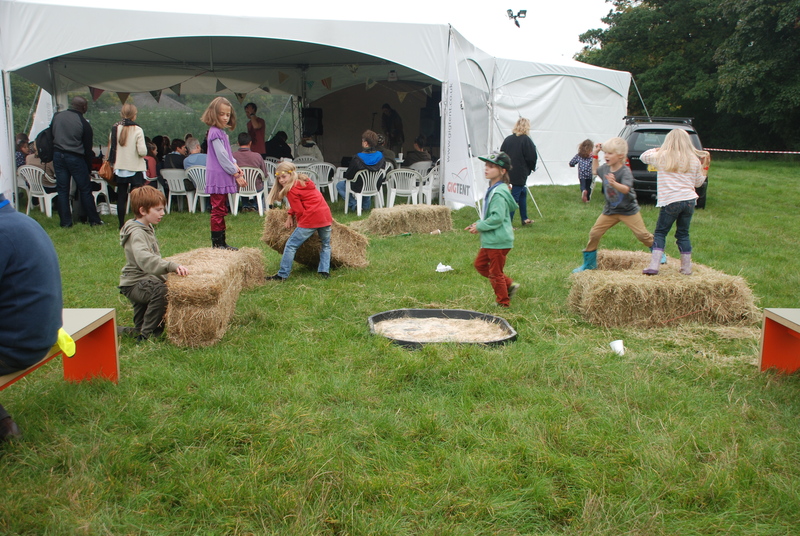 Anyone who thinks kids wouldn’t enjoy a folk festival, or would end up getting bored – should have come to Folkstock. This pretty much includes the whole festival. Beginning to end. From arriving in the morning with no clue what to do (sorry to mention it Helen, but you missed me off of the production mailing list… 🙂 ) – luckily the cars either side of us in the car park included Lauren Deakin-davies (Helen’s daughter) on one side – who verified who I was, and a kind stranger on the other side, who by chance had printed off a spare production car parking pass, and gave it to us! (thank you so much, whoever you were!) 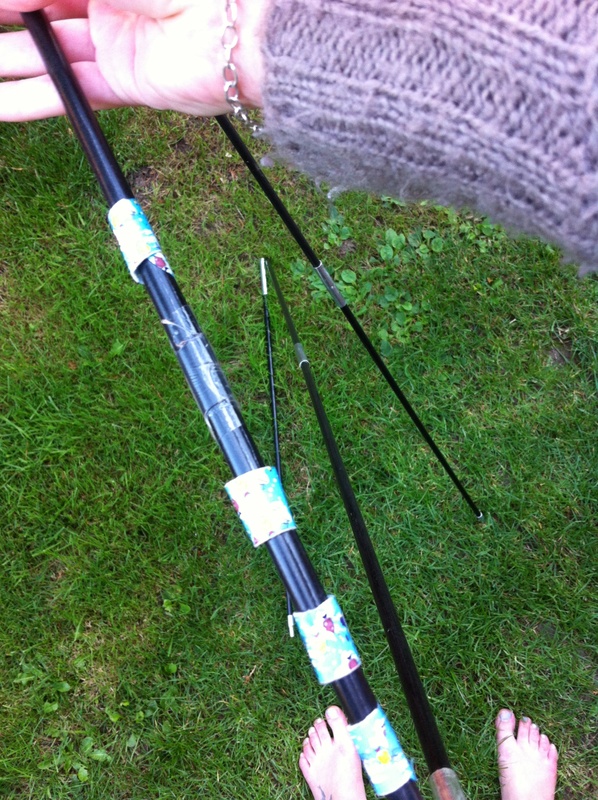 to snapping my tent pole clean in half when putting my tent up in the evening (luckily, ever the problem-solver, I remembered I had some children’s plasters in my bag [I’m a hands-on Auntie] which I used to hold it together). It was the kind of fun, crazy, random, exciting day I’d hoped it would be! Some of the people I chatted to. Altitude Arithmetic was invited to the inaugural year of family-friendly trad-mod folk/roots fusion acoustic music festival, brainchild of Helen Meissner and home for a day to more than 70 artists from local to more nationally known performers and debut to veteran professionals at ‘Folkstock’. 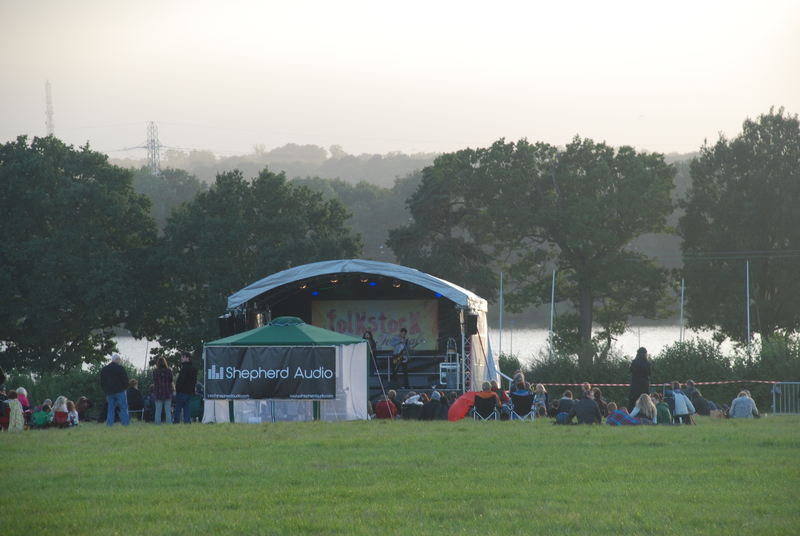 Four dedicated stages were erected in the rugged leafy green fields of Aldenham Countrypark, just south of the pink streamer-covered visitor walkway and completed with everything from singing/ukelele workshops to various arts & crafts stalls, a selection of ciders, ales and the occasional wandering face-painted, stick-banging Morris Dancer…. 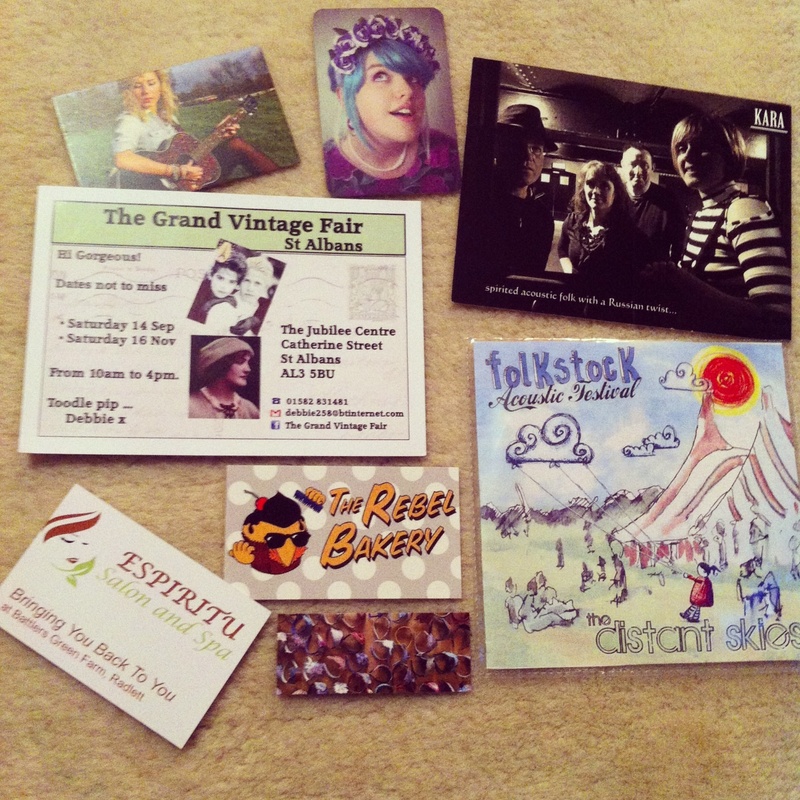 I’ve made no secret of the fact that Folkstock is all about providing a platform of opportunity. Of course the Folkstock Foundation, which the festival was born out of, was established to support new and emerging acoustic, folk and roots musicians and help to bridge the gap between artists and the harsh business and marketing world – which is the ethos of the entire event – and I’ve written before about the fact that the festival was used to launch local business: Espiritu, but there’s an underlying current that runs a bit deeper than that, in my view. As you may well know, Folkstock Festival is being used as a case study for social and community research by Dr Linda Wilks, and I’d like to put my two-pence worth in (that’s what a blog is for, surely?). Whether realising the extent of this or not, Folkstock has allowed me as an individual to explore some of the links between professionalism; breaking into a career path, and the way that a combination of student media and local events can help one to realise their potential. 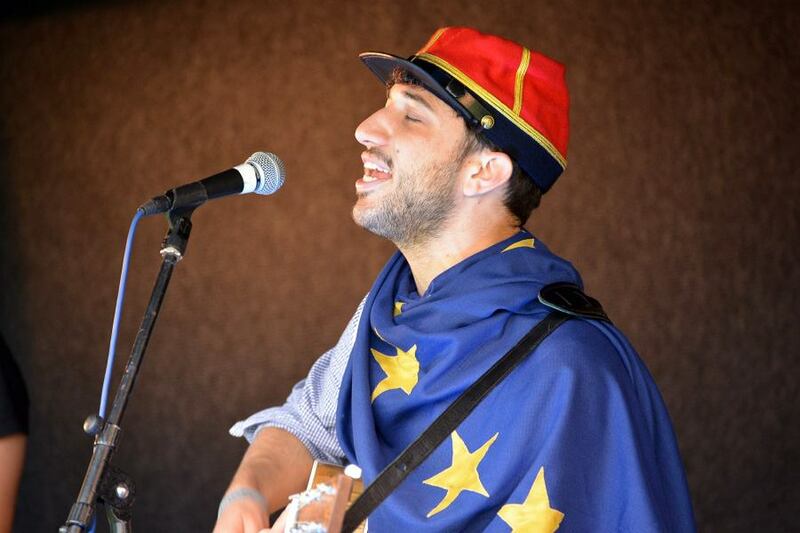 Earlier in the year Festival Director Helen Meissner approached me, as the then Editor of Hertfordshire Students’ Union magazine; BlueMoon, to write an article about Folkstock Foundation, the festival, and its lead-up events. 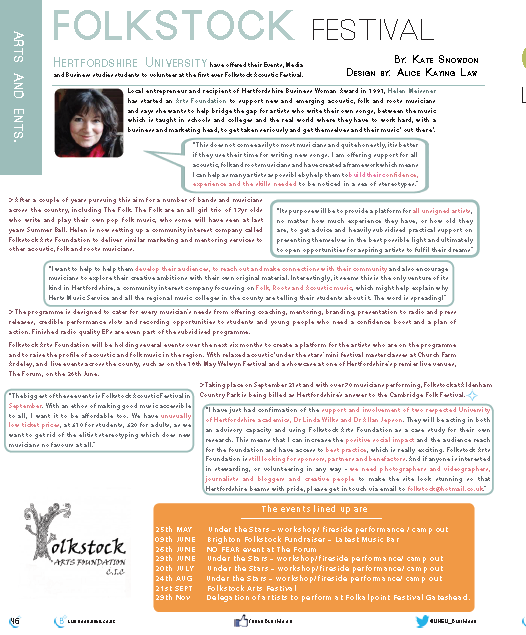 I was able to include the piece in my ‘Talent Issue‘, which I’d hoped would provide exposure to the many positive things that the students at the University of Hertfordshire are doing; the research taking place, the awards won, and also advice from graduate peers and a spotlight on ways and places to showcase said talents (cue the article about Folkstock). I’d also hoped that my team of writers, photographers and designers responsible for creating our magazine would gain some recognition too. It was a ploy that worked well. After sending out a copy to Helen (as I did with all the interviewees and contributors external to the university) she researched me and found I’d blogged for the St Albans Film Festival for its debut year. All of a sudden I was agreeing to become the official blogger of Folkstock Festival (bringing a student’s eye view to the proceedings) and my associate editor; Kealie Mardell (an up and coming music journo) was given opportunity to interview the festival team and artists for the UniVerse Newspaper. Better still, unbeknownst to me, the model of one of our featured photos was being signed up to perform at her first festival. 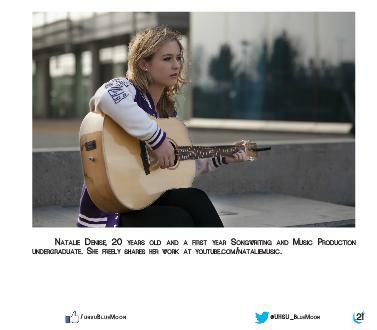 I have to give credit to photographer Saahil Dossani of S.H Photographic for his stunning photo of singer/songwriter Natalie Denise (which incidentally won a Student Recognition Award for Student Media’s Best Photo). This captured Helen’s eye and with a bit more research, she had brought Natalie on-board (I can’t stress enough how appreciated it is when professionals take the time to follow up on individuals!). 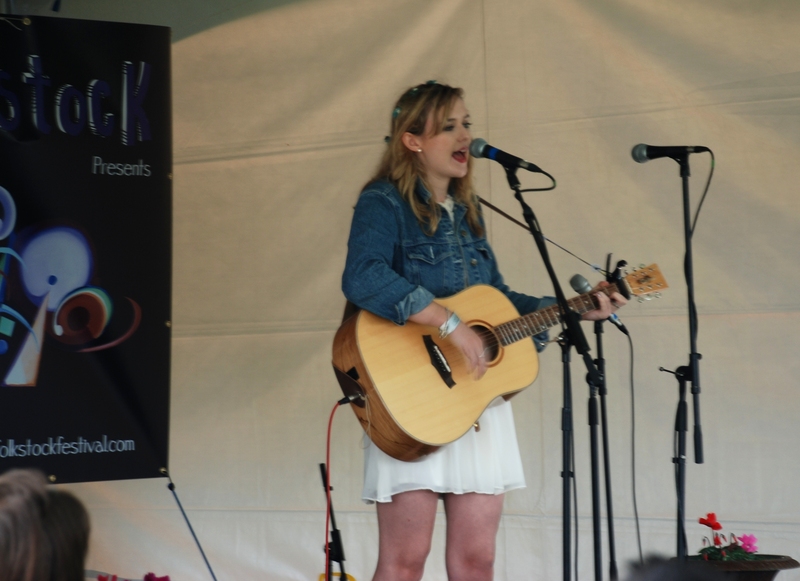 Natalie did a great job on the Folkstock Presents… Stage on Saturday. You’d have never known that this was her first festival performance; her sweet voice and moving lyrics of her song dedicated to her nan (Little Hand) – which she is using to fundraise for the Alzheimers Society – had the audience captivated. I hope this leads to good things for her. Find out more about her charity single here. Never one to miss a trick, you may have read already that I took a small team with me to help with coverage of last Saturday’s festival. There was two reasons for this: the first hope was that between the three of us, we would be able to get some form of coverage of as many artists as possible; whether it be photography, video, audio interview, a tweet, or simply notes on my page – and secondly, because I knew it would give an opportunity for my fellow UH students to put their skills into practice in a real, live event environment. Eric Sawyer, our videographer for the day, is an enthusiast for all things media, and is set to take on the role of head of Hertfordshire Students’ Union television outlet this academic year. He has filmed many of the acts at the festival and is currently completing post production work and editing footage ready uploading on this blog. All of which will be making its way to our video page. 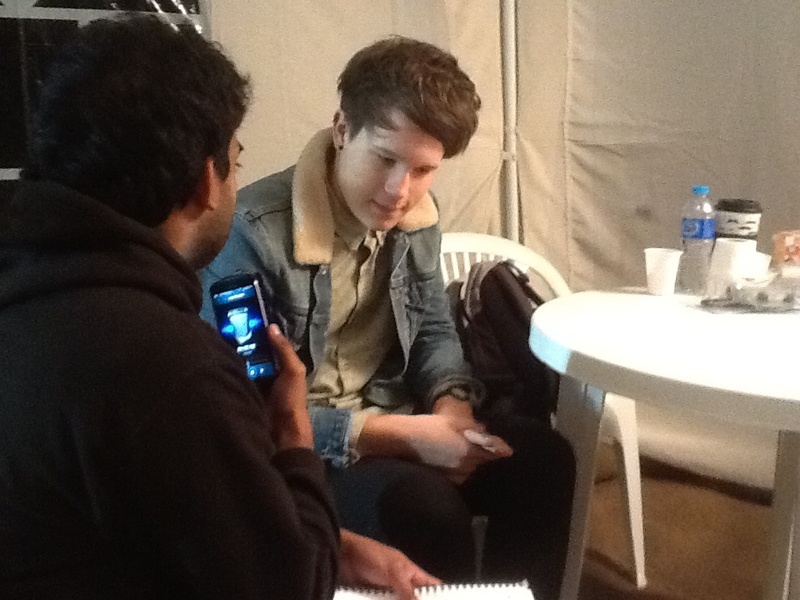 Audio editor and interviewer Michael D’Souza was the Assistant Station Manager for Crush Radio last year. I invited him along after listening to his repertoire of interviews on SoundCloud and remembering that he was looking to explore radio further and make industry contacts. 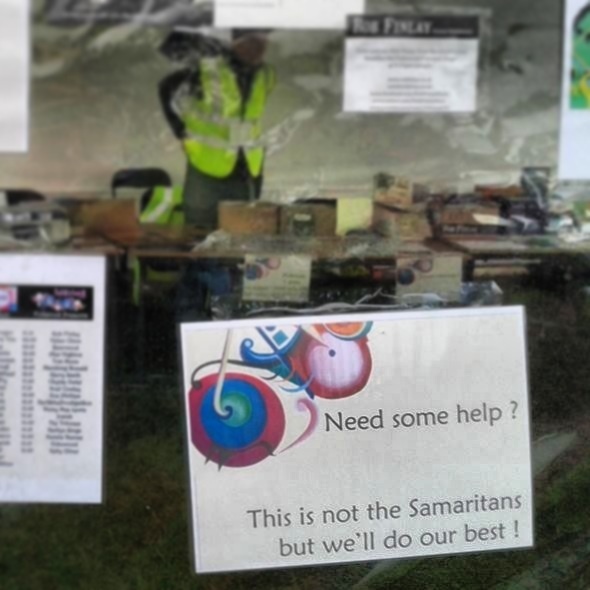 There came a brilliant moment when I was covering the Main stage when BBC Cambridgeshire’s Sue Marchant, who was host for that stage, commented before Pauline Alexander & Edwin Gallagher’s set that radio’s don’t do enough to support these kinds of events. So all in all, students and community do go hand-in-hand – and when a local organisation and event gives us the opportunity to step-up, I think we media-folk can produce great results in promoting local talent, and in turn can help promote our own talents. I think we all gained something from the festival on Saturday; whether it be exposure for the artists or exposure as journalists, bloggers and media producers. Exposure and opportunity: that to me is the lasting impact of Folkstock Festival. Stay tuned for my last few summary posts coming up over the weekend and lots of videos too! Even with an All Access press pass – and being the official blogger of Folkstock Festival, the blogging team still had to queue up this Saturday at Folkstock to speak to eighteen year-old Luke Jackson (behind all the other press in attendence) which really is credit to his popularity! (I said in my post on Livelikeavip.com that perhaps next year we may be seeing artists such as Luke being regulars on the celebrity gossip blog). But Luke was still super friendly and obliging when we set Mikey D the task of carrying out a ‘memorable interview’ – and he was the only other person at the time (until a later interview with Lucy Ward) who saw the same images in the ink test as me! Funny, that the two acts whose lyrics I felt I connected most with (Luke’s Last Train and Lucy’s For The Dead Men) answered in the same way! – They must have a similar mind to me (poor people)! Anyone get the feeling that Mikey D‘s ‘thorough research’ came from the previous post about Luke? 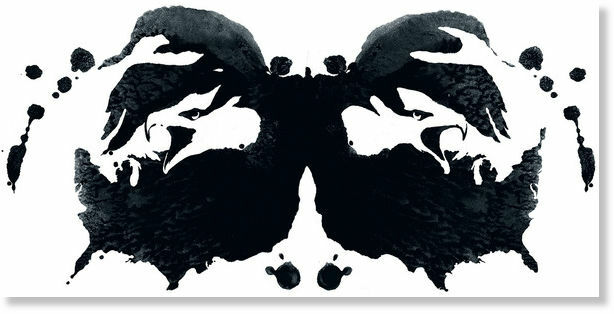 Here’s the ink blot tests that Mikey and Luke are discussing in the interview. 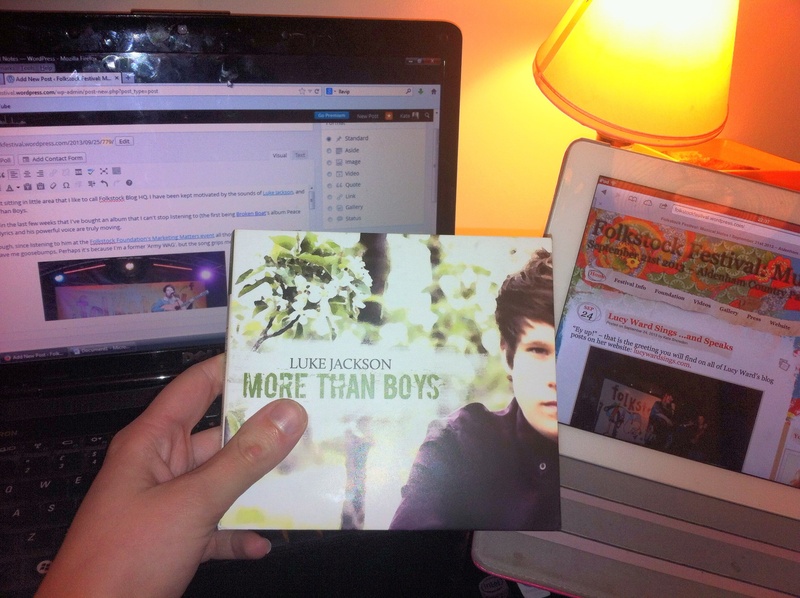 Much of this week, whilst sitting in little area that I like to call Folkstock Blog HQ, I have been kept motivated by the sounds of Luke Jackson, and his debut album More Than Boys. This is the second time in the last few weeks that I’ve bought an album that I can’t stop listening to (the first being Broken Boat‘s album Peace and Quiet), but Luke’s lyrics and his powerful voice are truly moving. I knew this already though, since listening to him at the Folkstock Foundation’s Marketing Matters event all those weeks ago – where his song: Last Train genuinely gave me goosebumps. Perhaps it’s because I’m a former ‘Army WAG’; but the song grips me. I’ve been desperate to get a copy of his album ever since, so I was more than pleased when he announced at the end of an awesome set on the Main Stage at Saturday’s Folkstock Festival (I think its fair to say that Luke got the loudest reaction from the crowd all day) that he’d brought some copies of the CD along to sell! 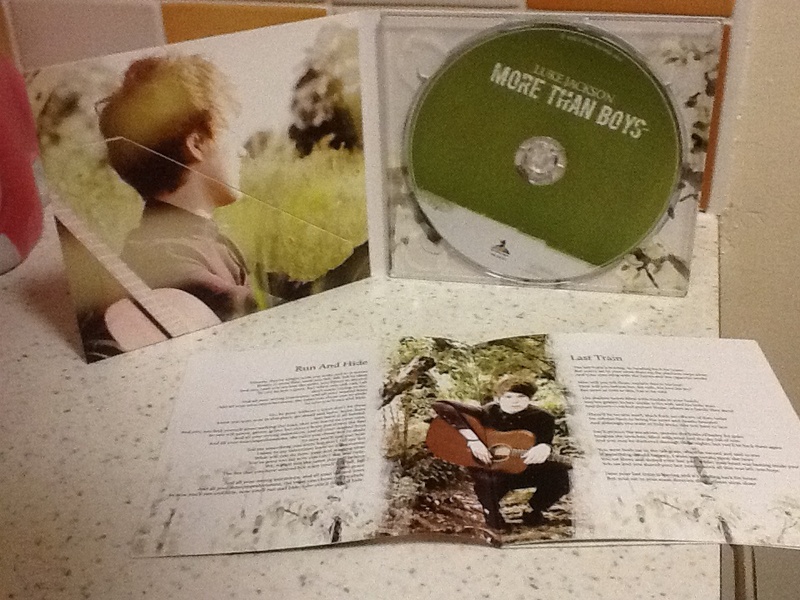 And I do love CDs that still include quality photos and lyric listings! Anyway, have a listen to Mikey D’s interview – I’d love to know what you’re thoughts on the X Factor discussion are (to be a hypocrite, or to not be a hypocrite – comment box below please)! 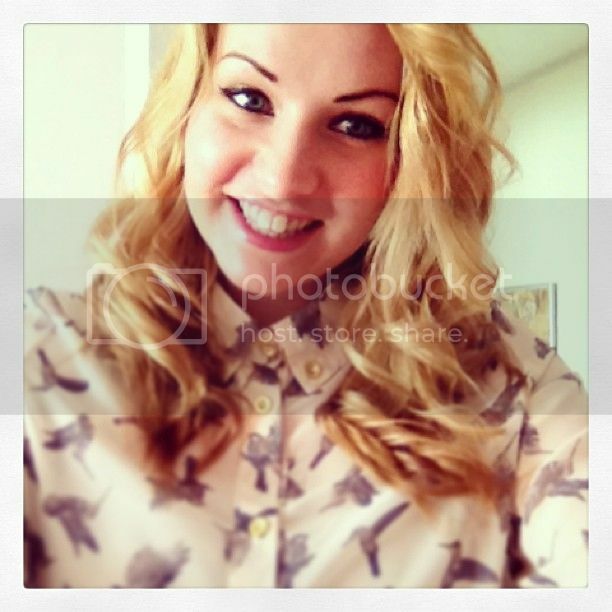 “Ey up!” – that is the greeting you will find on all of Lucy Ward’s blog posts on her website: lucywardsings.com. When it came to the evening proceedings of Folkstock, I definitely had a mark next to her name on my programme – I wasn’t going to be missing the Derbyshire beauty. I wasn’t sure what it would mean for her set – and to us as an audience – when it was announced a few minutes before she was due on stage that she would be moving from the Main Stage to the Alt Stage; but I’m glad she did. I’m not entirely sure of the reasoning behind the move, but I thought the Alt Stage had had a good vibe all day, and felt like it was its only little gig in the space it was given (its own little pocket of Folkstock) – so to have Lucy headline this stage was a fitting end to the energy we had seen here all day. And boy, did Lucy have energy! I could tell from the reaction of the crowd that many of the audience members were fans and followers of Lucy – I don’t think there was a single song where people weren’t singing along unprompted! (Even the song about talking dirty in Hawaiian was happily sung along to!). 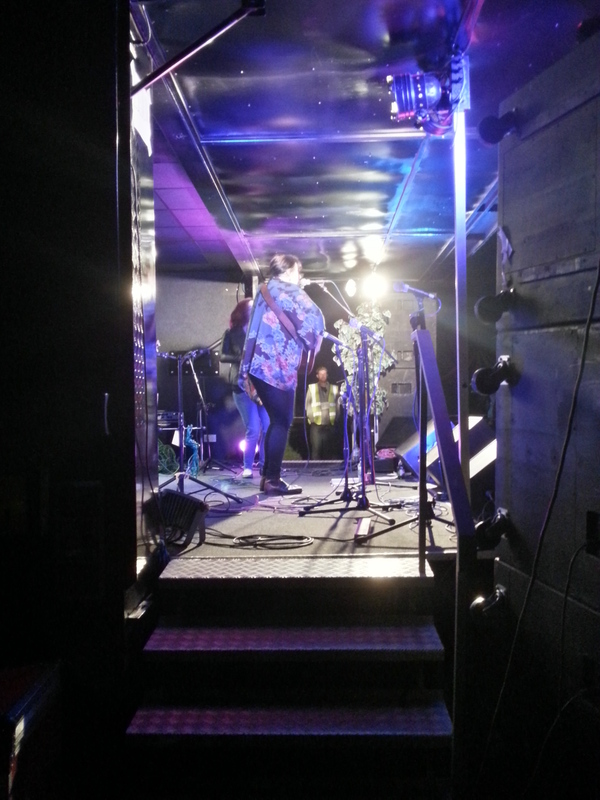 It was a great set to finish our Folkstock blogging work on (we decided to treat ourselves when we headed to the Main Stage, by keeping headliners Kris Drever and Eamonn Coyne as a work-free end to the day! ), but not before letting Mikey D loose with some questions. Feel free to tweet Mikey with some REAL facts about Derby! 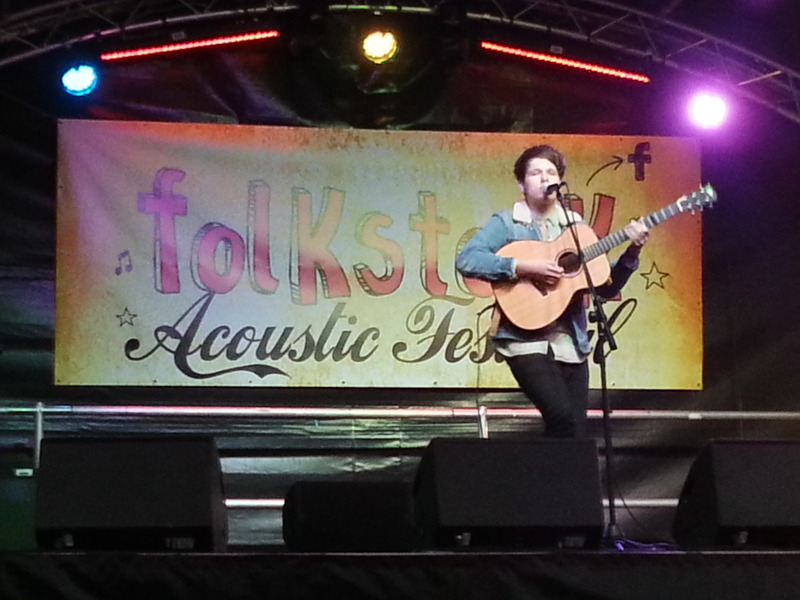 It really is great to see so many positive responses and warm words of thanks in response to Folkstock Festival. 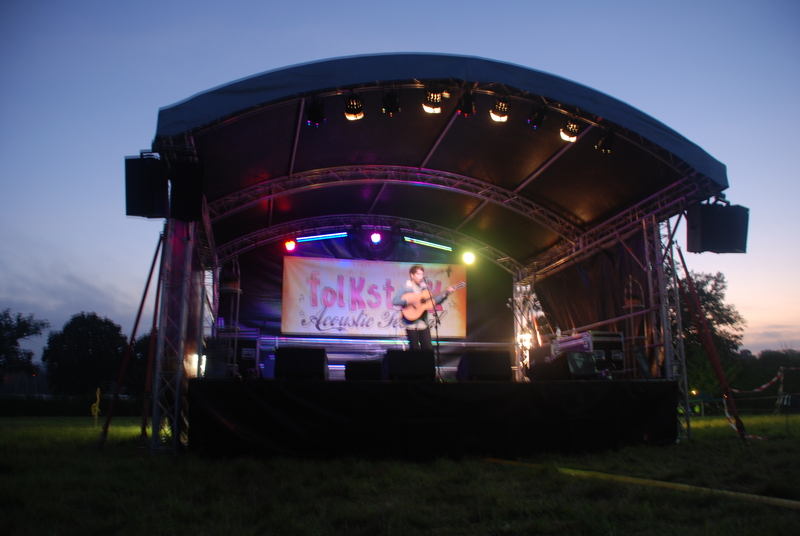 If you went to the festival, you might be interested to know that we are collecting feedback for Folkstock Arts Foundation to assess the social benefits of music festivals and would really appreciate a few mins to complete this easy to do survey. Click here to access it. I was lucky enough to attend (& play) the inaugural Folkstock Festival this past weekend & what a lovely festival it was too. 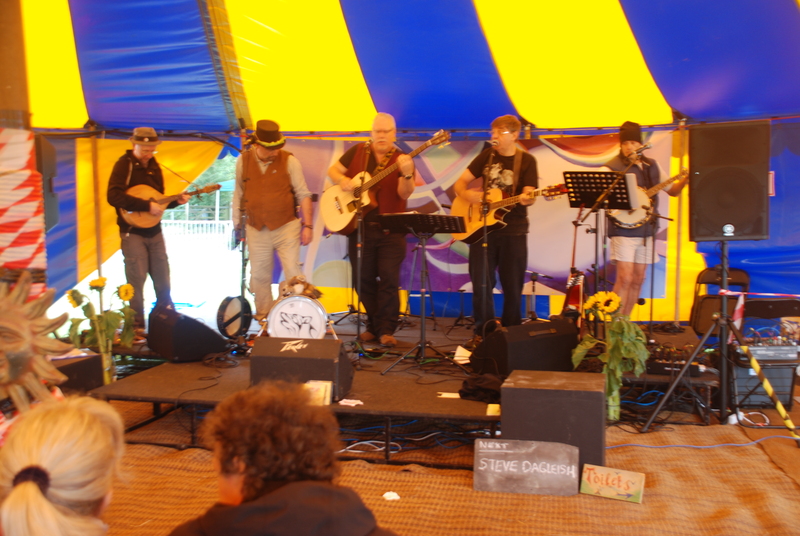 Folkstock is an acoustic festival whose proceeds go to the charites Cancer Research UK and the Folkstock Arts Foundation (helping support and develop acoustic artists). A new boutique festival has no right to be this friendly,this welcoming & this well organised has it? Well Folkstock most certainly was.Stages were managed with military precision yet with a warm & personal touch that was charming. Set in the beautiful grounds of Alderham Country Park they had 4 stages of music & an assortment of homespun stalls & activities for everyone. Reblog: How much musical talent can you cope with seeing in one day? How much musical talent can you cope with seeing in one day? 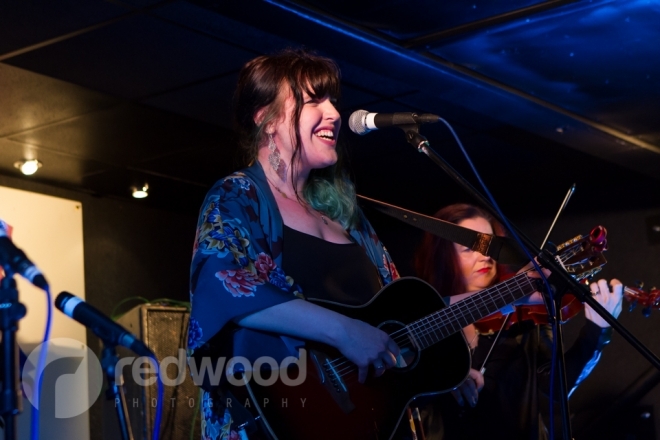 Folkstock was a bit mind-blowing….a diverse array of artists that started off really well and that just seemed to get better and better as the day went on. Great festival….top job by organiser Helen Meissner and team. Best acts? Well the headliners were all good of course…The Willows, Lucy Ward, Boho Dancer….but other stand-out acts for me were Luke Jackson, Tom Moon, The Good The Bad and The Ginger, Ben Smith (blew me away), Flaming June (great stage energy), Fred’s House (been listening to their stuff for a while now), Alice (check out her single ‘Soldier’ on iTunes – seriously good!) and The Fallows (yeah I know I’m biased ‘cos they’re from Cov…but they’re still brilliant!). READ THE REST OF THE BLOG POST HERE.